Children in Year 1 and Reception at Navigation Primary School had the chance to explore dinosaurs and fossils when an expert from Everything Dinosaur was invited to their school. As part of a day of dinosaur themed teaching activities that had been planned by the teachers and the school’s hard-working support staff, the children were given the opportunity to make their own comic strips, design prehistoric animals, create giant dinosaur themed art as well as to get up close to fossils. Dinosaurs as a topic can really help young children develop a keen interest in reading and the children were enthusiastically showing all the books that they had been studying about dinosaurs, one little boy even brought a book from home to show our dinosaur expert. When it comes to developing an extensive vocabulary the children were quick to help out with lots of adjectives and having seen the long list of questions that Miss Carney and Miss Bolchover had compiled with the help of the children, it was clear that the dinosaur workshop had fired young imaginations. Dinosaur day inspires young, creative minds. The picture above shows some of the questions that the children in Year 1 came up with. There were some amazing and thoughtful questions asked by the children, Miss Johnston’s favourite was why do dinosaurs go “grrr”? As a topic, whether just for a day, as in the case of Navigation Primary or for a whole term, dinosaurs enthuse both girls and boys and really get them to engage with creative writing activities as well as helping to underline important teaching aims related to literacy, numeracy and simple scientific fundamentals. For example, Emma showed our dinosaur expert part of a comic strip that she had started to create. She had taken a great deal of care over the selection of her characters for her story, no doubt inspired by some of the fossils she and her class mates got the chance to handle. Miss Sugden commented on how excited all the children were, she also mentioned that the teaching staff were also very keen to learn all about dinosaurs. We look forward to hearing more about how Emma and her friends develop their comic strips. Tyler was delighted to learn that there was a large and fearsome marine reptile that had a name similar to his own (Tylosaurus). Alex’s favourite dinosaur was Spinosaurus and we were happy to help Alex appreciate just how big this carnivorous, African dinosaur actually was. Which flying reptile am I? Young Dylan was inspired to draw a flying reptile (Pterosaur), he challenged our dinosaur expert to have a go at identifying which one it might be. With something like 130 different species of Pterosaur now described it was quite a challenge working out which flying reptile Dylan had illustrated, we might have to ask Mrs Grosscurth (one of the teaching support staff at the school), to help us out. During the dinosaur themed day, the teaching team had come up with lots of creative, hands-on activities for the children to try. Young Freddie created his very own “Jurassic Park” scene on one of the classroom’s computers. If there was a competition for the most amount of dinosaurs squeezed into a single picture then we think Freddie’s colourful illustration would win. Teaching about dinosaurs in schools can lead to all sorts of extension activities. Everything Dinosaur challenged the Reception and Year 1 children to have a go at designing their very own dinosaur. They were asked to label the body parts and to think of a name for their prehistoric beast. We saw some amazing and very imaginative dinosaurs, one of the best we saw was young Henry’s contribution. Not sure what name Henry will give his multi-coloured dinosaur but “Rainbowsaurus” was suggested. A lot of work had gone into planning the day and it was nice to explain to Mr Harrison, that, just like Tyler there was a prehistoric animal that shared a similar name – Scelidosaurus harrisoni and it was an English dinosaur too. It was a pleasure visiting the school to teach about dinosaurs and our thanks to all the teachers and staff who helped make the children’s day so special. Unfortunately, a couple of the teachers were unable to attend, but not to worry, we are confident that Mrs Mykoo, Mrs Fisher and the rest of the staff can fill them in about all things Dinosauria. Miss Johnston and Miss Bolchover had even made a large, outline sketch of the dinosaur. The children were encouraged to use their thumb prints to make the scales of the classroom’s very own dinosaur. Our dinosaur expert was not sure what name the children would come up for their very own prehistoric monster, but we look forward to hearing what they came up with. Young Rosie, amazed us when she explained all about the armoured dinosaur Ankylosaurus and Nora learned that there were some fantastic dinosaurs whose fossils have been found in Spain. Teaching about dinosaurs in primary schools can help young minds to gain an appreciation of quite challenging concepts such as deep time, extinction, how fossils are formed and evolution. Looks like Navigation Primary School are helping to produce the next generation of scientists. Modern humans (Homo sapiens) are susceptible to some diseases as a result of inherited genes due to our interbreeding with Neanderthals (Homo neanderthalensis) according to a study published in the academic journal “Nature”. A joint American and German-based team of researchers from Harvard Medical School, (Boston, Massachusetts) and the Max Planck Institute for Evolutionary Anthropology (Leipzig, Germany), have looked at the genetic makeup of over 1,000 people and compared this to the analysed genome of a Neanderthal toe-bone that is believed to be around 50,000 years old. The team also concluded that along with our susceptibility to some diseases, the inability to give up tobacco in some portions of the human population may be due to genes passed onto us from Neanderthals (not that Neanderthals smoked, as far as we know). In addition, other traits such as hair colour, strong nails and the ability to adapt better to cold climates could be a result of our partial Neanderthal heritage. Research into the genetics of ancient hominids. In those members of our present population who are non-African in origin, there is a small amount of Neanderthal DNA present in their genetic make-up. The level of Neanderthal DNA varies from approximately 2% to 4%. 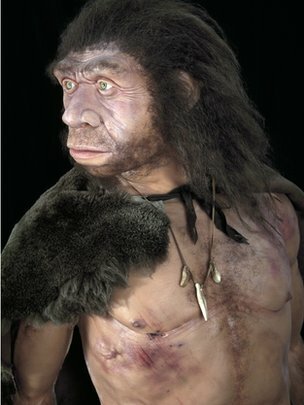 Some Neanderthal DNA would be expected due to the belief that modern humans and Neanderthals shared a common ancestor. However, the relatively high level suggests that there was interbreeding between these two species in the past. New research suggests that in parts of the Old World, there were as many as four different types of hominid living at the same time. The genetic relationship between these populations is very complex. Part of this complexity is put down to interbreeding between species. One of the genetic traits identified in this new research is that the Neanderthal’s genes to help adaptation to a colder climate by having tougher skin and nails may have been passed onto Homo sapiens that migrated northwards out of Africa. People alive today, who are indigenous to sub-Saharan Africa, whose ancestors did not migrate out of Africa when Neanderthals were still present in Europe, carry very little Neanderthal DNA. What they do carry would be as a result of our species sharing a common, ancient ancestor with the Neanderthals or perhaps a species of hominid from very far back in the human evolutionary line. One of the conclusions made from the genetic study of the Neanderthal toe bone suggests that based on this evidence Neanderthal populations may have been very inbred. The exact genetic relationship between Neanderthals and a third species of human that lived in Europe the same time as Neanderthals as well as H. sapiens has yet to be fully understood. Everything Dinosaur team members have already reported on one of the findings from research of this kind, the prevalence for type 2 diabetes being an inherited trait from Neanderthals. In addition, it seems that Neanderthal genes may also predispose parts of the modern human gene pool to lupus, long-term depression, Crohn’s disease (inflammation of the digestive tract, a condition that affects around one person in every 700 in the United Kingdom), plus an autoimmune disease of the liver. When Crohn’s disease is considered, it seems that Neanderthals passed on different genetic markers that increase and decrease the risk of this condition. The London Natural History Museum’s Professor Chris Stringer, although not an author of this research, is regarded as an authority on the study of ancient hominids. He explained that the findings added a new dimension to the debate over how early humans interacted with Denisovans and Neanderthals. He stated that this research, in his opinion, did not challenge the current thinking that our ancestors originated in Africa. The evidence suggests that some Homo neanderthalensis/H. sapiens hybrids may have had reduced fertility, or in some cases they may have been sterile. Sterility in such hybridisation indicates that our species and Neanderthals, despite probably sharing a common ancestor, were so genetically far apart at the time of interbreeding, that these two species were only just compatible in terms of the ability to produce fertile offspring from any such union. Human and Neanderthal genetic research. There have been a number of papers published recently highlighting the research into the various taxonomic and genetic relationships between our species and other ancient hominids. At the turn of the year, Everything Dinosaur team members made a number of predictions about what news stories this web log was likely to cover over the next twelve months. We confidently predicted that further genetic research such as this would reveal more data relating to the linkages between our species and other hominid branches on the human family tree. Team members at Everything Dinosaur have received reports from Yeading Infant and Nursery School that a strange object has been found in the school’s discovery play area. A number of children examined the large, white object with the help of their enthusiastic teachers and it has been decided that a dinosaur could have built a nest and laid an egg in the school grounds. Encouraged by their school’s literacy co-ordinator Mrs Siyani, Year 1 and Year 2 pupils wrote letters to our dinosaur experts inviting one of our team members to visit the school to teach about dinosaurs and to help with a programme of creative writing that had been inspired by the discovery. Could This Be a Dinosaur Egg? Dinosaur egg helps with creative writing week. Everything Dinosaur received lots of letters from school children inviting one of the company’s experts to visit the school, our thanks to Tiya, Jeevan, Amani, Shanaiya, Habib, Praveen, Zara, Arham, Hanan and all their chums for writing to us. Tiya even drew a picture of the object and sent it into us, with her letter. Tiya and her friends measured the egg and discovered that it was approximately 35 centimetres long. A source close to the school stated that there had been reports of a dinosaur being sighted in Hayes Town Centre, although the team member from Everything Dinosaur despatched to investigate was unable to confirm whether or not a dinosaur had been spotted in this part of the London area. Praveen’s letter to Everything Dinosaur. The teaching team are using the discovery as part of a week of themed writing activities with Reception, Year 1 and Year 2 classes. The boys and girls at the school are being encouraged to write about dinosaurs and other amazing prehistoric creatures and the teachers have prepared an innovative and “egg-citing” range of activities including Year 2 children researching about their favourite dinosaurs and creating fact sheets about them. The Everything Dinosaur team member who visited the school was most impressed with the children’s knowledge about dinosaurs. He promised to send to the teachers some more information and resources to help with the intended scheme of work, as well as encouraging the children to write about their dinosaur egg and what might happen if the egg hatched. Everything Dinosaur invited to visit school. As part of a number of dinosaur workshops held throughout the day, children got the chance to get up close to some real fossils and they learned some amazing dinosaur facts. The Everything Dinosaur expert challenged the children to include some of the facts that they had learned in their stories and writing exercises. He even promised (with the support of the teaching team), that some of the children’s work might even get onto this web log. In this way, the children’s stories, fact cards and posters could be published just like a real scientist’s. Dinosaurs inspire young children to write. Perhaps the reception children, with the help of their teacher could compose a thank you letter. Could the children have a go at designing their own dinosaur with some of the materials supplied by Everything Dinosaur? We look forward to hearing more about the children’s work on dinosaurs and discovering what ideas the staff have had after our visit with regards to teaching about dinosaurs in schools. In May of this year, team members at Everything Dinosaur are expecting to receive stocks of the new Schleich Velociraptor (Velociraptor green, as it is referred to in some circles), this will mean that Schleich will have three Velociraptor models available. Two of these models are in the larger prehistoric animal series, the third is in the “die kleinen Dinos” range. This will mean that for the moment, Velociraptor figures make up 12.5% of the entire Schleich prehistoric animal model collection. When the Tyrannosaur models are considered, T. rex and Velociraptor figures make up a quarter of the entire “World of History” prehistoric animal offering from the German company. From a palaeontological perspective, there have been a number of exciting discoveries made in the last few years concerning the Velociraptorinae. Velociraptorinae is the term used to describe a sub-family of Dromaeosaurids – small meat-eating dinosaurs. Although scientists still debate the taxonomic relationships between different types of Dromaeosaurids, including which ones may or may not have been more closely related to Velociraptor, new fossil finds has led to the describing of several new genera. We have Linheraptor (L. exquisitus) named in 2010 and Tsaagan (T. mangas) discovered just a few years earlier. Both these dinosaurs come from Asia, but recently, a paper on a new Late Cretaceous Dromaeosaurid from North America was published. It is always a pleasure to see new interpretations of dinosaurs introduced into the model market. Velociraptor is a perennial favourite with both young boys and girls and this dinosaur regularly features in the top five of our annual survey of the most popular prehistoric animals. For instance, in 2013 Velociraptor was ranked at number four, up one place from the previous year. Comparing two Schleich Velociraptor dinosaur models. In the picture above, the new Velociraptor-like model has been placed by the smaller Schleich Velociraptor from the series which we at Everything Dinosaur refer to as the “Schleich Dinosaurs”. Although the models share the same colouration, the new figure is considerably larger, measuring around 18cm in length and standing 12cm high. The posture has been changed from the earlier pre-production, concept images that we have viewed. The skull has been re-sculpted to permit it to have an articulated jaw and the model has been given a more classical “Velociraptorinae look”, with a longer snout. The tail on the new model has been made longer and straightened, perhaps in response to comments received after the concept images were viewed. This new version will also have moveable arms, a feature that will no doubt, prove very popular with this model’s target market, children aged from 3 years upwards. The feet are not posed in the classical raised second toe posture of the “raptors”. Both the other Schleich Velociraptor figures show this anatomical feature very clearly. The second toe is somewhat enlarged in this new replica, but the claw tip is resting on the ground. Track way evidence suggests that for most of the time this claw was probably held aloft with these types of carnivorous dinosaurs, but studies have shown that this second toe could be rested on the ground. When walking or running, this claw was pulled up and back to avoid the tip being blunted. When attacking this claw with its sharp tip, could swivel through 180 degrees and be used as a crampon to help these fierce predators hold fast when struggling with prey larger than themselves. The three-toed, resting claws position is probably a concession aimed at the younger aged model market, as this pose helps the model stay upright and stable on an uneven surface such as a bedroom carpet. Velociraptor Dinosaur Model from Schleich. 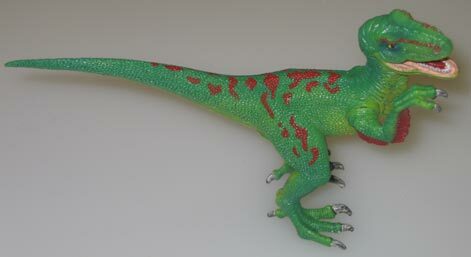 The red and green colouration, along with the fearsome reputation of this particular dinosaur should make the Schleich Velociraptor a firm favourite. This model will be suitable for children from three years of age and its large size makes it ideal for creative, imaginative play. The arm has bright red quills, a feature recorded on the fossilised ulna of Velociraptor spp. For those model fans who prefer their dinosaurs to have slightly muted tones, there is always the “World of History” Velociraptor which was part of the original set of replicas introduced by Schleich back in 2012. To view Everything Dinosaur’s short video review of this Velociraptor model simply click on the Youtube video link below. Team members at Everything Dinosaur were given special permission to make a short video that shows the four new dinosaur models being introduced by Schleich this year. We have already posted up pictures of the new Velociraptor, the Tyrannosaurus rex, the brightly painted Schleich Pentaceratops (our favourite) and the long-clawed and fearsome looking Therizinosaurus. These models are currently in production and they will be available from Everything Dinosaur in May of this year. All these models are not to scale and they are going into the Schleich “World of History” dinosaur model range, that brings this particular series up to a total of sixteen replicas. The Therizinosaurus will have moveable front limbs, as will (we think), the Velociraptor. The T.rex and the Velociraptor will also have articulated jaws. 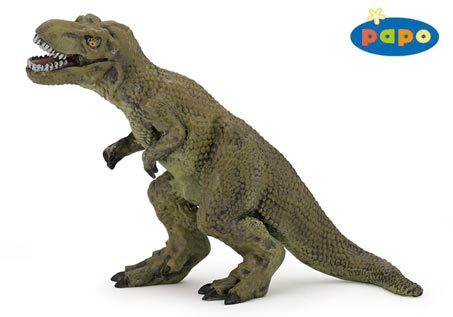 The current Schleich “World of History” range already features a Tyrannosaurus rex and a Velociraptor, the new T. rex and the bright green Schleich Velociraptor figure, which should be available from Everything Dinosaur in May, are not replacements but they are designed to complement the existing model range. Today, January 26th, is Australia Day, the day when Australians celebrate “all things to do with Australia including the cricket” as one colleague described it. It was not until 1994 that this day become a public holiday down under but in homage to Australians everywhere, we thought we would mark the twentieth anniversary of this day becoming a public holiday by putting up links to some of the many Australian dinosaur and prehistoric animal articles Everything Dinosaur team members have written and posted on this blog site. Over the last twenty years or so there have been a number of new dinosaur species named and described by Australian scientists, very many of these from the fossil rich “badlands” of Queensland around the small town of Winton. There have also been a number of prehistoric marsupials fossils also found over the last two decades, which has helped extend our knowledge of the diversity of this particular group of mammals and to shed light on the possible causes of extinction for much of the country’s mega fauna. We hope Australians everywhere enjoy their national day. Spotted in a magazine and sent into Everything Dinosaur with some accompanying notes was this article (reproduced below), which stated that plant-eating dinosaurs did not eat grass. The sender wondered why a picture of the carnivorous Tyrannosaurus rex had been used to illustrate this snippet and they asked whether the assertion that plant-eating dinosaurs did not eat grass was true. Did plant-eating dinosaurs eat grass? Grasses are members of the Angiosperms (flowering plants), a very successful group and an important one to us humans as rice, oats, wheat, maize and barley are just some of the grasses that are cultivated by us for food. It had been thought that the first flowering plants evolved early in the Cretaceous, but recent research has suggested that the first Angiosperms may have evolved much earlier, sometime in the Triassic possibly. The grasses themselves (Gramineae), the true-grasses, were once thought to have evolved during the Cenozoic, with the first fossil evidence being dated to around 55 million years ago, a good ten million years or so before the extinction of the Dinosauria. However, there is some fossil evidence to suggest that grasses were present at the very end of the Age of Dinosaurs, around 66 million years ago, so these may well have been grazed by herbivorous dinosaurs. As for the other plants mentioned in the brief article, it is worth remembering that ferns would have represented a considerable portion of the biomass of most terrestrial Mesozoic environments but the inclusion of palm trees in the list is intriguing. Palms may superficially resemble more ancient flora such as cycads, but they are not closely related. In fact, palm trees are a relatively recent addition to the Angiosperm group. The first fossils of palm-like plants occur in Late Cretaceous strata dating deposited around 80 million years ago. By some 70 million years ago, during the Maastrichtian faunal stage of the Late Cretaceous and as the Age of Dinosaurs came to a close, it seems like a number of palm genera had evolved (members of the Arecaceae family). In the 15 million years or so after the end of the Mesozoic Era, the planet experienced a period of prolonged global warming. Extensive rain forests covered much of the Earth’s land masses. There were jungle habitats as far north as Canada and southern Scandinavia. Palms and a number of other types of Angiosperms seem to have flourished in the hot-house atmosphere and a very wide range of palms evolved. The grasses themselves really came into their own from about when global temperatures began to fall and the tropical forests began to be replaced by plants more suited to drier, colder environments. 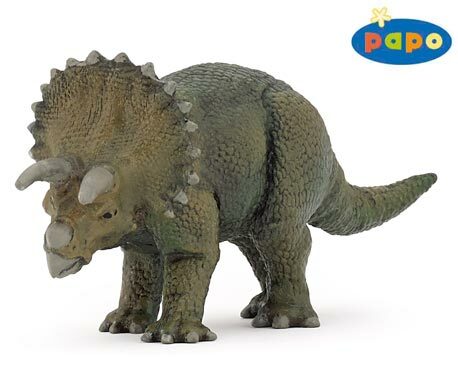 Everything Dinosaur team members have received a number of requests to post up further pictures of the dinosaurs that make up the new for 2014 Papo mini dinosaurs tub. This miniature model set features six prehistoric animals, namely T. rex, Spinosaurus, Stegosaurus, a raptor (presumably Velociraptor), Triceratops and a Brachiosaurus. A mini T. rex dinosaur model. The mini Spinosaurus dinosaur model from Papo. These two carnivores are extremely popular with young dinosaur fans, in fact Spinosaurus and Tyrannosaurus rex featured in the top two in Everything Dinosaur’s 2013 survey of the most popular prehistoric animal models in the fossil record. Intriguingly, the dinosaurs represented by this set of mini dinosaur figures made up the top six in Everything Dinosaur’s annual census. Note the sickle-shaped claw which is raised on the hind feet. One of our favourites in this set and the first of three herbivores that we will feature here is the cute Stegosaurus. The mini Stegosaurus from Papo. This model has a lovely quizzical expression. Not sure what our walnut-sized brained Stegosaur is thinking but we really like the cute expression on his face. These models will be sold as a set in a clear, plastic tub which also makes a handy storage jar for when it is time to put these models away for the night. Last but not least, comes the chunky looking Brachiosaurus. It has been suggested that since Papo already makes larger versions of these dinosaurs, these particular replicas could be used to represent babies or juveniles of the species. This mini dinosaurs model set is likely to be available in the second quarter of 2014. A spokesperson for Everything Dinosaur stated that although production schedules were subject to change, it was anticipated that this model set would be available sometime around late May or June of this year. Whilst working with Key Stage 1 children carrying out a dinosaur workshop in school, one of our dinosaur experts was shown this lovely collage of a colourful Sauropod by an eager, young dinosaur fan. The dinosaur featured is a Camarasaurus (C. supremus for example). It is certainly a very colourful collage. 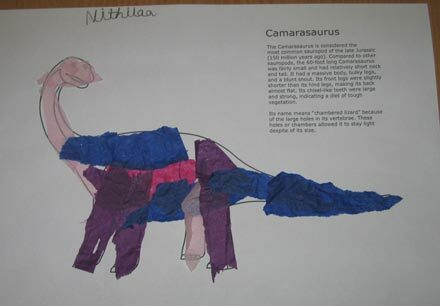 The artwork was produced by Nithilea, as part of term topic in which the children learn all about dinosaurs in school. We loved the idea of using bright and colourful tissue paper to create a very funky looking dinosaur. Camarasaurus was a long-necked, plant-eating dinosaur. Palaeontologists have estimated that this creature which was related to the Brachiosaurs could reach lengths of up to 20 metres. Our dinosaur experts were most impressed with the dinosaur artwork on display in the school. Everything Dinosaur team members have been busy looking at the first samples of the new Schleich 2014 dinosaur models. This German company intends to introduce four not to scale models this year, there is a long-clawed Therizinosaurus, a new Tyrannosaurus rex model, a new raptor (Velociraptor spp.) and a brightly painted horned dinosaur called Pentaceratops. Four new Schleich dinosaur models to look forward to. Over the next few days or so, Everything Dinosaur will be posting up new images and further information concerning these prehistoric animal models. We expect to have them in stock in May of this year. The four dinosaurs in the picture date from the Cretaceous although T. rex and Pentaceratops lived in North America, whilst Therizinosaurus and Velociraptor fossils herald from Asia.